The Order of the Hospital was founded in the Holy Land as a hospice and monastic community to care for the sick in 1048, if not some years earlier, by the Blessed Gerard (who was probably from southern Italy). In 1113 it received papal approval. By this time it was an order of knights whose principal objective was the defense of pilgrims. It soon became a military as well as religious order which participated in many crusader activities and military campaigns. Gerard died in 1120, succeeded by a series of grand masters beginning with Raymond du Puy. There were a few Norman-Sicilian knights of Saint John (sometimes called "Hospitallers") as early as the reign of King Roger II, but in fact the order's greatest influence in Sicily, in the form of commanderies similar to those of the Teutonic Knights and Templars, was most felt around the beginning of the reign of Frederick II circa 1200. It was Frederick who later assigned most of Sicily's Templar commanderies to the Hospitallers following what he believed to be an affront by the arrogant Templars during his "Sixth Crusade" in 1228. Frederick took his rights as King of Jerusalem seriously and could not tolerate offenses to this royal dignity. Though a number of Sicilian feudal knights of the Swabian era participated in the Crusades, apart from Frederick's single peaceful Sixth Crusade they usually did so independently of their king (contrast this to the crusading fervor of Louis IX of France), leaving to join the military-religious orders. In general, though his policies changed with the times, Frederick - like his Norman predecessors - chose to accomodate his own Muslim subjects rather than offend them through such activities as crusading. After the fall of Jerusalem the knights established their seat at Cyprus and, in 1310, at Rhodes, where they remained until a bloody defeat at Muslim hands in 1523. In 1530 the King of Sicily, who was also the Holy Roman Emperor, Charles V, gave the displaced knights the island of Malta during a ceremony in the barons' hall in Steri Castle in what is now Piazza Marina in Palermo. Initially the knights' Maltese dominion was actually a fief of the Kingdom of Sicily, its Grand Master a vassal. Thus an annual feudal tax was paid, though this was largely symbolic. It included, for example, a "Maltese falcon." The Order would remain a feudal dependency of the Kingdom of Sicily (by then ruled by the House of Bourbon of the "Two Sicilies") until 1798 though, like the feudal tax rendered to the king, this was to be largely symbolic in actual practice. In recognising the Sicilian feudal tradition linked to the order, it is interesting that Fort Sant'Angelo, the seaside castle the knights found when they arrived on Malta, was built in the same style as the Steri by the same family, the Chiaramonte, who in the fourteenth century were lords of Malta and Gozo. Napoleon's forces expelled the knights from Malta in 1798 en route to Egypt, and following the defeat of the French the island nation passed to British control. The knights were welcome in Sicily. The grand magistry was transferred to Messina and Catania and finally, in 1834, to its present location in Rome. Today the Order of the Hospital of Saint John is known as the "Sovereign Military Order of Malta" and supports hospital works around the world. It is a sovereign government recognised diplomatically by many nations and the Holy See (papacy), with observer status at the United Nations General Assembly. For several centuries a handful of military outposts along the southern coasts of Sicily were manned by the knights of Malta to defend the island from marauding pirates. By 1800 the inland commanderies were few and the coastal fortifications had been abandoned. The role of the knights in Sicily was never as important as in other nations. In London, for example, their legacy endures in place names such as Saint John's Wood and Saint John's Gate, though Henry VIII suppressed the order in England. How can it be that the order was more important in France, and even in far-away England, than in Sicily? There is no simple answer, but the relationship of the order with Sicily (ruled by Spain until the eighteenth century) was largely collaborative and military, while elsewhere it was more economic. Perhaps for this reason, the Sicilian holdings of the Knights of Malta were never as extensive as those in certain other countries. In the nineteenth century, after its removal from Malta, the decoration of the order (the "Maltese Cross") grew popular as a "reward" to titled aristocrats, from whose ranks the actual (military) knights were drawn for many centuries. 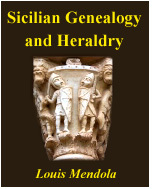 By then its importance in Sicily had long diminished. 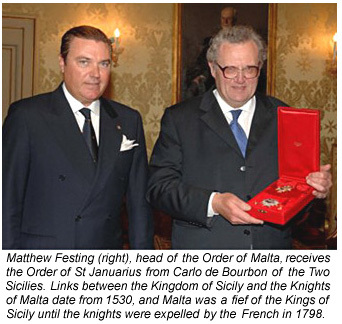 The last Bourbon king was deposed in 1861, the last Savoy in 1946, but - in a sign of friendship rooted in another time - the Order of Malta still maintains a quasi-diplomatic rapport with the House of Bourbon that once ruled Sicily. When Matthew Festing (shown here), set foot in the Steri's hall of barons on an unseasonably hot Saturday (September 29th) in 2012, he was the first Grand Master to visit the castle in several centuries. About the Author: Freelance journalist Daniela Paglia formerly taught history and Italian studies in a high school in Catania. This article was written in collaboration with Luigi Mendola, our history editor.